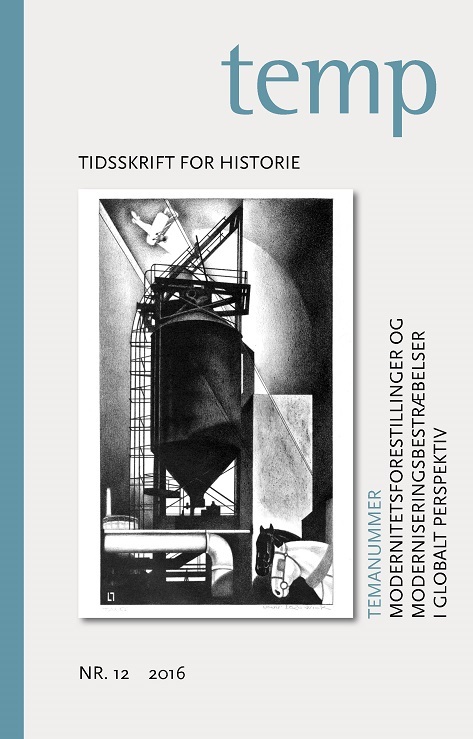 Denne artikel analyserer ideen om ”den socialistiske by”, der lå til grund for byplanlægningen og omstruktureringen af Moskva i 1930'erne. Omdrejningspunktet for analysen er konstruktionen af byens metro, der indgik i statens selvfremstilling, som et fysisk bevis på konstruktionen af socialismens realitet i Sovjetunionen. De massive, sovjetiske moderniseringsbestræbelser i Moskva havde dermed et æstetisk og symbolsk formål: at delegitimere både det omstyrtede, kapitalistiske system i Rusland og de konkurrerende kapitalistiske systemer i Vest – og derved at fremstå som en fysisk manifestation af fremtidsvisionen om ”den socialistiske by”. Beaujour, Elizabeth Klosty: 'Architectural Discourse and Early Soviet Literature', Journal of the History of Ideas (44:3), 1983, 477-495. Bittner, Stephen V.: 'Green Cities and Orderly Streets: Space and Culture in Moscow, 1928-1933', Journal of Urban History (25:1), 1998, 22-56. Buck-Morss, Susan: 'The City as A Dreamworld and Catastrophe', October (73), 1995, 3-26. Castillo, Greg: 'Gorki Street and the Design of the Stalin Revolution'. I Z. Celik, D. Favro og R. Ingersoll (red. ), Streets: Critical Perspectives on Public Space, California: University of California Press: Berkeley and Los Angeles, 1996, s. 57-70. Crowley, David og Susan E. Reid: 'Socialist Spaces: Sites of Everyday Life in the Eastern Bloc'. I D. Crowley og S. E. Reid (red. ), Socialist Spaces – Sites of Everyday Life in the Eastern Bloc, 2002, s. 1-22. Foucault, Michel: Sikkerhed, territorium, befolkning, København: Hans Reitzels Forlag, 2008. Hirsch, Francine: Empire of Nations: Ethnographic Knowledge and the Making of the Soviet Union Ithaca: Cornell University Press, 2005. Jenks, Andrew: 'A Metro on the Mount: The Underground as a Church of Soviet Civilization', Technology and Culture (41:4), 2000, 697-724. Josephson, Paul: '”Projects of the Century” in Soviet History: Large-Scale Technologies from Lenin to Gorbachev', Technology and Culture (36:3), 1995, 519-559. Kopp, Anatole: Town and Revolution – Soviet Architecture and City Planning 1917-1935, London: Thames and Hudson, 1970. Kaganovitj, Lazar: Pobeda metropolitana - Pobeda sotsializma, 1935. Kettering, Karen: 'An Introduction to the Design of the Moscow Metro in the Stalin Period ”The Happiness of Life Underground”', Studies in the Decorative Arts (7:2), 2000, 2-20. Kotkin, Stephen: Magnetic Mountain – Stalinism as Civilization, Berkeley og Los Angeles, California: University of California Press, 1995. New York Times 16.5.1935, The Associated Press: ”Moscow Opens Subway; Stations Are Like Palaces”. New York Times 17.5.1935, Harold Denny: ”Parade in Moscow for New Subway”. Pertjik, Lev: Bolsjevistskij plan rekonstruksij Moskvy, 1935. Rees, E. A.: Iron Lazar – A Political Biography of Lazar Kaganovich, London: Anthem Press, 2012. Rose, Nikolas: Powers of Freedom, New York: Cambridge University Press, 1999. Scott, James C.: Seeing Like a State – How Certain Schemes to Improve the Human Condition Have Failed, New Haven: Yale University Press, 1998. Sezneva, Olga: 'Living in the Russian Present with a German Past: The Problems of Identity in the City of Kaliningrad'. I D. Crowley og S. E. Reid (red. ), Socialist Spaces – Sites of Everyday Life in the Eastern Bloc, 2002, s. 47-64. Stalin, Josef: God velikogo perelom, 1929. Stalin, Josef: Sovjet Narodnikh Komissarov SSSR, Zentraljnij Komitet BKP(6), Postanovlenie, ot 10 ijulija 1935 g. N 1435, O generalnom plane rekonstruktsii goroda Moskvy, 1935. Stepanova, Lidija: J'est metro, 1935. Stites, Richard: Revolutionary Dreams: Utopian Vision and Experimental Life in the Russian Revolution, Cary, NC: Oxford University Press, 1988. Stronski, Paul: Tashkent – Forging a Soviet City, 1930-1966, Pittsburgh: University of Pittsburgh Press, 2010. Vujosevic, Tijana: 'Soviet Modernity and the Aesthetics of Gleam: The Moscow Metro in Collective Histories of Construction', Journal of Design History (26:3), 2012, 270-284. Wolf, William K.: Russia's Revolutionary Underground – The Construction of the Moscow Subway 1931-1935, Columbus: Ohio State University, 1994.